Our mission at Jamesport Brewing Company is to create award winning. quality consistent craft beers that our customers can enjoy in fun, laid back atmosphere. Come enjoy a Jamesport Brewery craft beer today! Helping Michigan’s economy one beer at a time! 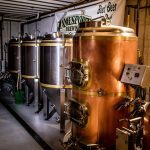 Jamesport Brewing Company operates a 3 barrel brew house. 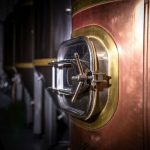 The brewing process starts with the 3 barrel direct fire kettle and mash/lauter tun system. The “beer” is then transferred into one of our fermenters. Our system has 3, 6 barrel fermenters for a maximum production of 18 barrels at any one time. After fermentation the beer is ready to be served and is transferred to the coolers. 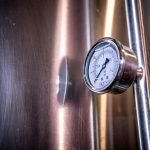 Cooler options include one of our 6, 6 barrel serving tanks, or 2, 3 barrel serving tanks. 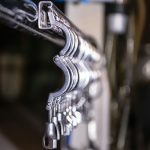 Given our high summer demand, a significant number of half barrel kegs are also filled and maintained in one of large coolers. Jamesport has 14 available taps giving us the option to serve 14 unique craft beers at any one time. Our brewery has consistently provided the “Best Beer in Port” for 16 years. If available, our brewer would love to show you around the brewery! All you have to do is ask. Our Head Brewer is Pat Saxton. 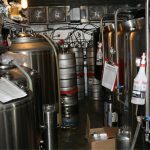 He has worked in the brewing operations side of the restaurant for over 10 years. His employment with Jamesport started on Dec, 2002 as a bus boy/host. He worked himself up through the ranks to server, bartender, and manager. During that time he also working as assistant brewer. 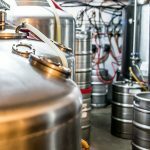 In the spring of 2015 Pat attended the Siebel Institute of Technologies World Brewing Academy and received a certificate for completing the Concise Course of Brewing Technologies. Pat credits much of his work ethic and skills to our previous Head Brewer, Tom Buchanan who he worked under and alongside for most of 10 years. He looks forward to continuing our tradition of creating great craft beers for Jamesport customers.